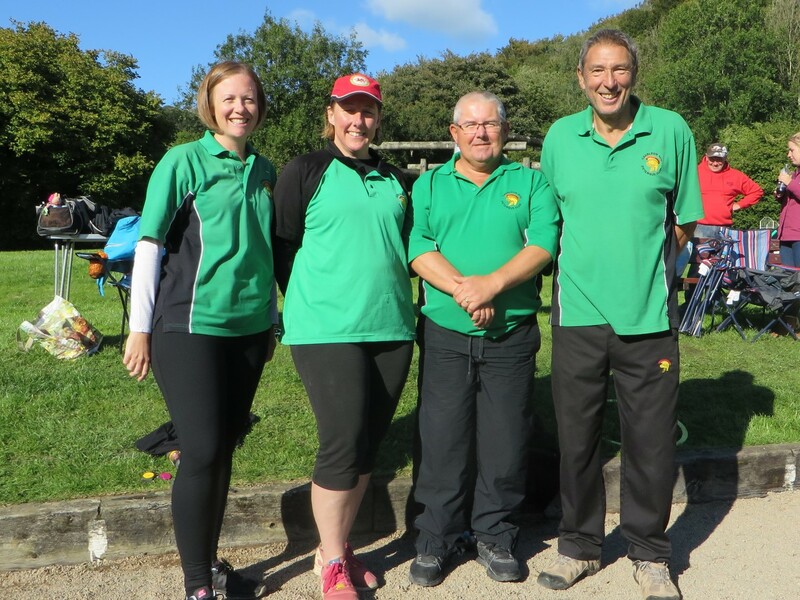 The WPA League Cup and Plate finals took on Sunday 23 September 2018 at Creigiau PC on a dry mainly sunny day despite all the forecasts of a very wet morning. Maesteg, Monkstone Minotaurs, Isca Romans & Penarth Pendragons were contesting the Cup semi-finals whilst in the Plate, 2 teams had withdrawn leaving Wenvoe Dragons and Monkstone Mystics to contest the final. In the semi-finals of the Cup competition the Minotaurs were drawn against Maesteg and had a bad start when Kensett and Adshead (B) were fannied by Clare & Field. It seemed the Minotaurs pair didn’t realise the game had started. Fortunately the other pair, Maroney (J) and Adshead (V), kept the Minotaurs in the tie with a 13-2 win against Edwards & Stevenson so at the changeover the deficit was only 2 points. Kensett & Adshead bucked their ideas up in the second game and ran out 13-6 winners against Edwards & Stevenson leaving Maroney & Adshead needing 9 points against Clare & Field to secure a Minotaurs win. From the start of the game Maesteg always had their noses in front and at 12-6 things weren’t looking good for the Minotaurs. Both sides were aware of the situation but Maroney & Adshead proved to have the stronger nerves taking 2 points on the next end. This left the scores exactly level but when they took another point on the next end, the Minotaurs were home and dry. The game finally ended in a Maesteg win by 13-10 for a 2-2 draw but the Minotaurs had won 36-34 on countback. This result seemed most unlikely after the opening game. In the other semi-final Isca Romans got of to a flying start against Penarth Pendragons with a fanny by Mayfield (T) & Tomczyk and ran out comfortable 3-1 winners with a points score of 50-29. The Plate competition was disappointing in, that with only 2 teams, it left Monkstone Mystics to go directly into the Final against Wenvoe Dragons. The First Division team with pairs Cannan & Jellings and Westall & Coleman proved too strong for the Mystics pairs of Clarke & Baildon-Smith and Dunn & Smith (J) and ran out winners by 3-1 and 47-25. After lunch there was only the Cup Final to contest between the Minotaurs and Isca Romans to whom the Minotaurs had suffered two 4-0 defeats in the League. The Minotaurs left themselves with a mountain to climb when Kensett & Adshead and Maroney & Adshead both went down 2-13 to Mayfied & Tomczyk and Foster & Gregory (P) respectively. Team captain Adshead (B) tried to rally his team by reminding them that they could still win with two fannies! This battle cry obviously had some effect as Kensett & Adshead ran out easy winners by 13-4 against Foster & Gregory followed by Maroney & Adshead having a comfortable 13-6 win against Mayfied & Tomczyk. Unfortunately for the Minotaurs, despite the 2-2 draw, is was not quite enough with Isca Romans winning 36-30 on countback. At least the Minotaurs had salvaged some pride after the opening 2 games. 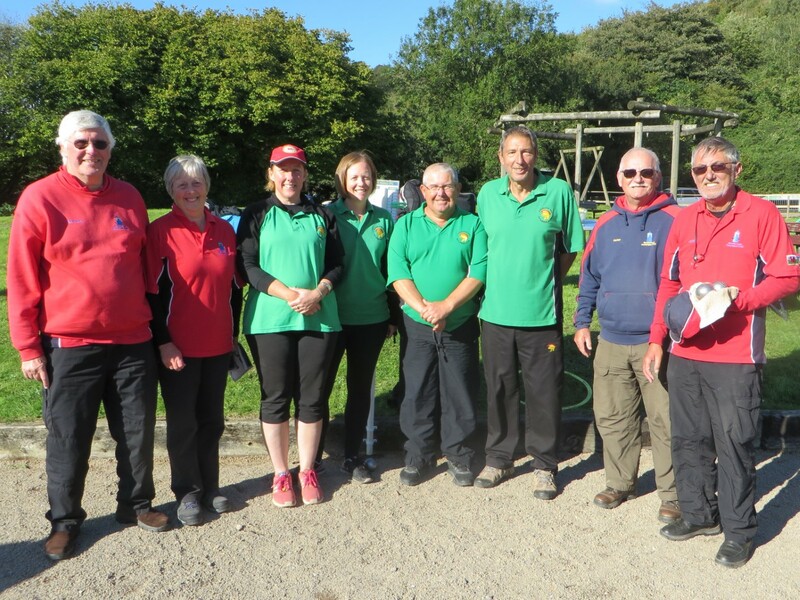 Congratulations to Isca Romans on their deserved win and a big thank-you to Harry Drake and all the members of Creigiau PC who worked hard to host the day and make it a great success.